Maricel Cabahug is a member of the senior executive team of SAP SE, the world’s market leader for business software. As Chief Design Officer (CDO) and Global Head of SAP Design, Maricel’s overarching goal is to deliver the best user experience to the world’s business users. Maricel and her organisation are passionate about co-innovation with customers to realise greater business value through technology that works for people. As Chief Design Officer, Maricel is responsible for SAP’s overall design strategy and product design. At the heart of everything she does is her goal to improve people’s lives by making work delightful. Maricel is a software engineer turned thought leader in design and user experience. She combines her knowledge of mathematics, computer science, and business with her curiosity to constantly learn new things and her passion to improve how people work. She also deeply understands customer needs thanks in large part to her previous role as CIO of Yaskawa Electric where she worked before she joined SAP in 2011. Her career spans more than 25 years in the IT sector, including leadership positions across APJ, North America, and Europe. Dr Daniela Lange is Vice President for Product Management at SAP SuccessFactors, heading the product teams for Payroll, Time Management, Compensation and Benefits. As such, she is responsible for building the next generation product suite in the cloud, taking good care of on-premise customers and guiding them in their digital transformation journey to the cloud. Daniela is also passionate about the question how technology can help break biases in the workplace. She is executive sponsor for the “Business Beyond Bias” product initiative at SAP. In a first phase, the primary focus is on gender, with the intent to explore other diversity aspects such as ethnicity and cultural background, sexual orientation, disabilities, age etc. Daniela joined SAP in 2000. She held multiple roles in software engineering and product management in the area of Globalisation and Legal Compliance, covering Human Resources and Financials. Equal rights is more than “the right thing” to do morally; it also promises significant economic rewards for everyone. A McKinsey Global Institute report finds that $12 trillion could be added to global GDP by 2025 by advancing women’s equality. How can we as business leaders foster diversity and inclusion to make a positive impact on the bottom-line and the fabric of our society? 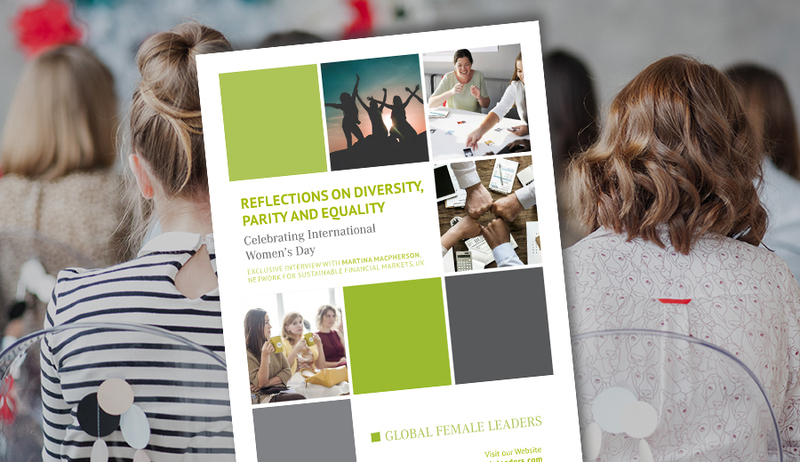 For decades, companies around the world have been struggling for more gender equity, often with costly diversity programmes, and with little success overall. So, if we have the awareness and the best intentions, why are we struggling? Gender bias is usually unintentional. And if we don’t know we are biased, it’s virtually impossible for us to change our behavior. Gender inequity is the result of lots of small biases adding up over time. Even if each occurrence of bias is subtle and we tend to shrug it off, together over time they can results in serious consequences. This effect has been nicely illustrated in a simple computer simulation by Martell, Emrich and Robinson-Cox. The first step towards fighting bias is to become aware of it. This is one area in which technology can help. What can Technology do to Move Business Beyond Bias? Traditional software solutions have been centered around analytics. Year after year we look at disheartening gender statistics and feel helpless and frustrated. Analytics can only measure the problem, not solve it. By the time the statistics are made, the damage has already been done. Stepping on a bathroom scale doesn’t make you lose weight and as many well know can certainly be frustrating. For real change to happen, many small habits have to be changed day after day – eating an apple instead of a cookie, taking the bicycle rather than the car. One way to counteract bias is right in the HR decision-making process itself, when the manager can still correct the decision. And the changes must be embedded into the regular HR process across all the steps in the employee lifecycle – from attracting talent to recruiting, onboarding, rewarding, developing, and promoting. With the advance of machine learning and natural language processing, we can now tackle much harder problems such as bias detection in language. Technology can help us phrase job postings so that we do not accidentally scare off the applicants we are trying to attract. Technology can also expose inconsistent evaluations, for example when – for the same behavior – men are positively rated as assertive and women negatively judged as bossy. Machine learning and rules-based alerts can proactively support managers to look closer at their compensation practices, include external benchmarking data, and make equitable compensation decisions. If we design our systems with diversity and inclusion in mind, machines can also surface potential bias by connecting seemingly unrelated events, for example an alert when an employee’s performance is rated at an historical low and just so happens to coincide with her maternity leave. In all of these cases, technology provides insight, but the final decision remains with the human. In an ideal world, we would have the gender intelligence to correctly interpret differences in communication styles, and we would no longer apply different standards to men and women. Until that ideal world appears, we can design technology to increase our gender intelligence by sensitizing us and guiding us toward more consistent, fair and measurable decisions. Our bias should be toward action, not toward each other.